A friend of mine always made this for her holiday party. This Caramel -Brownie Cheesecake is so yummy - a great Southern Living recipe from one of their Christmas cookbooks. I made it for my teachers this past week and I love it. One of my daughters was home... and she thought it was amazing! I highly recommend this - if you like cheesecake! Combine vanilla wafer crumbs and butter - stirring well. Press mixture firmly in bottom and 2 inches up sides of a 9 inch springform pan. Bake at 350 for 5 minutes. Cool completely on wire rack. Combine caramels and evaporated milk in a small heavy saucepan - cook over low heat, stirring often, until caramels melt. 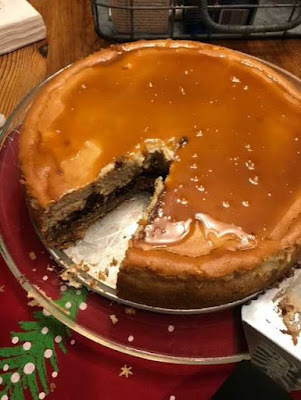 Pour caramel mixture over crust. Sprinkle with crumbled brownies. Beat cream cheese at medium speed with an electric mixer for 2 minutes or until light and fluffy. Gradually add brown sugar - mixing well. Add eggs, 1 at a time beating just until blended. Stir in sour cream and vanilla. Pour batter into prepared crust Bake at 350 for 50 - 60 minutes or until cheesecake is almost set. Remove from oven and cool to room temperature on a wire rack. Cover and chill for at least 4 hours. Remove sides and garnish if desired.